Description: Wholesale White Kimono Waffle bathrobes. Bulk price offer here at Towel Hub. 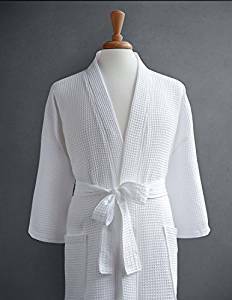 These bath robes are 65% Cotton and 35% Polyester blend. Light weight and excellent to use by Spas, Hotels, Resorts and for domestic use. Great price offer! Lowest price offer coupled with Excellent quality in the entire Country!!!!!!! Our LARGE size is "One Size Fit All"